Southampton: Stekelenburg, Cedric, Fonte, Yoshida, Targett, Davis, Wanyama, Tadic, Mane, Rodriguez, Pelle. Newcastle: Krul, Janmaat, Mbemba, Coloccini, Haidara, Anita, Colback, Sissoko, Wijnaldum, Obertan, Cisse. That's all from me for today. You can follow all the reaction from this game and from West Ham's 2-0 victory over Arsenal here. Build-up to Stoke v Liverpool (16:00 BST) is here. "Steve McClaren will have learned a lot about his team today. For 75 minutes they were the better side but he made a few changes and he needs to work out why they did not work. But those 75 minutes were better than anything else I saw from Newcastle last season. He has something to build on here." Jack Colback produces a brilliant block to deny Sadio Mane who was clear on goal. That may have saved the point for Newcastle. Chancel Mbemba makes a vital clearance to stop Graziano Pelle getting his head on a dangerous cross. "Daryl Janmaat does not make any contact towards defending the cross, and Shane Long stole in with a brilliant header. "Ten minutes ago we talked about whether Newcastle would be getting nervous, having failed to put the match to bed. I wonder what Steve McClaren is thinking now about taking Papiss Cisse off. Aleksandar Mitrovic came on and has only done one thing so far - kicking an opponent." Siem de Jong replaces Georginio Wijnaldum. Dusan Tadic puts in a great cross for Shane Long and the Republic of Ireland striker rises above his marker Daryl Janmaat to head into the top left corner. Before the match Steve McClaren said Aleksandar Mitrovic had "a bit of the devil inside him." And the Serbian is shown the yellow card for a bad foul on Matt Targett within seconds of coming on. Big cheers go round at St James' Park for their new £13m Serbia striker Aleksandar Mitrovic who comes on for Papiss Cisse. Steven Davis clips the ball over the top for Sadio Mane, but he can't quite bring it under control and Tim Krul collects. Newcastle break through Gabriel Obertan, it's three on two but they fail to make their advantage pay. Southampton then break at the other end, Sadio Mane thinks he is through but the striker is off-side. Vurnon Anita is off after falling awkwardly on his back after challenging for a high ball with Sadio Mane. The midfielder goes off and is replaced by Cheick Tiote. 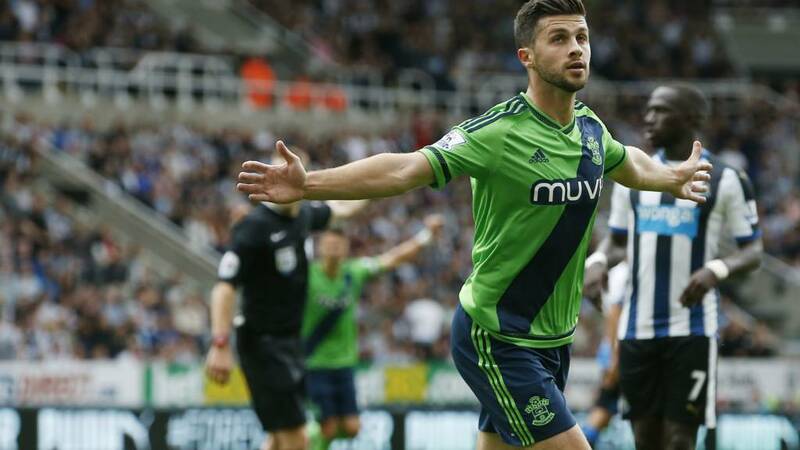 Shane Long comes on for Jay Rodriguez. Little to show today for the England striker but he will be happy to get some minutes under his belt after 16 months out. Jose Fonte upends Moussa Sissoko and earns himself a booking and concedes a free-kick. Jack Colback tries everything to bring down Sadio Mane, a few tugs, a push, an arm round the neck, he finally gets his man with a bad sliding tackle. Gabriel Obertan is really growing into this game and the former Manchester United winger has a shot from outside the box but it just goes wide. And here is exactly how that goal looked. Just after Mayo Yoshida sees his header put over the bar by Tim Krul's leg, Newcastle break. Papiss Cisse chips the ball into the path of Gabriel Obertan who sprints down the right wing and puts in a perfectly weighted cross for new boy Georginio Wijnaldum. The £14.5m signing rises to meet the cross and places a header into the top left corner. What a start to the second-half for Newcastle. Cedric Soares comes off for another new signing Cuco Martina, it's a straight swap at right-back. "A really enjoyable half of football. It's 1-1 just now but Newcastle shaded it for me. Now Steve McClaren has got something to get his teeth into with the goal, will he be going for it in the second half? I suspect he will be." Helen Louise: Come on Newcastle get fighting! David Ljunggren: " Oh good, Obertan is playing," said no Newcastle fan, ever. Thomas Downer: Very strong Southampton squad out today! Great to see Jay Rodriguez back as well. Get involved via #bbcfootball, text in on 81111 (UK only) and post a comment on the BBC Match of the Day Facebook page. I just mentioned he was industrious and just look at Cedric Soares' first-half heat map. The Portugal full-back is having an impressive debut so far and is enjoying getting forward. Looks like Southampton found a good replacement for Nathaniel Clyne. Honours even at St James' Park. Papiss Cisse cancels out Graziano Pelle's opener. Almost a lovely goal, the industrious Cedric Soares gets into the box and hooks the ball to Dusan Tadic who shoots over the bar. "Maarten Stekelenburg misjudged the cross so badly that there must have been a deflection on it. It went right over him and Papiss Cisse could not miss from there. Steve McClaren probably had a half-time team talk all planned out, but it's suddenly become a lot easier. Newcastle have deserved that." Massadio Haidara's cross takes an unfortunate deflection off Sadio Mane and past Maarten Stekelenburg, leaving Papiss Cisse to chest the ball into an open net. "Chancel Mbemba, the players he's up against in the air are starting to bully him. He looks a good player, strong, but in the air he's giving away three inches. He's not able to cope with Southampton's aerial threat - especially not against Graziano Pelle." Sadio Mane has a wild shot from outside the box but it is high and wide. Fabricio Coloccini almost puts Papiss Cisse through before the Senegal striker then falls over in the box, he appeals for a penalty, but the more likely scenario is he fell over his own feet. Another good chance for the Saints but Jay Rodriguez heads wide from Dusan Tadic's cross. The striker, number 18, gets on the end of Cedric Soares' cross. Huge appeal for handball and Newcastle fans aren't happy. Papiss Cisse tries to guide a corner into the box with his head, the ball hits Jay Rodriguez, but has it hit his arm, difficult to say. Steve McClaren has now made his way down from the director's box to the dugout. "That was just about Graziano Pelle's first touch of the game.There wasn't an awful lot of power on the header but the technique was perfect - it was so low down Tim Krul couldn't get down to it." Six touches, one goal, for Southampton striker Graziano Pelle. Graziano Pele connects with a powerful header from a Cedric Soares cross in the centre of the box to give Southampton the lead, slightly against the run of play. It is the Italian's 13th Premier League goal for the Saints. Cedric needs to be careful here he tries to muscle Massadio Haidara off the ball and concedes a free-kick and the referee has a quiet word. The Portugal defender is already on a yellow. Another poor delivery by Georginio Wijnaldum from the free-kick manages to fall to Fabricio Coloccini who controls and shoots straight at the arm of Maya Yoshia. Shouts for hand ball but not much the Japanese defender could do about that. A quiet start for Southampton's Jay Rodriguez so far, as shown by his touch map below. To be expected though after 491 days out through injury. A great strike from Dusan Tadic is tipped round the post by Tim Krul. Both sides having a go here. Then at the other end Papiss Cisse has his right footed shot saved by Maarten Stekelenburg, the shot from the Senegal striker didn't have too much behind it. Cedric Soares is played in by a delightful pass from Dusan Tadic. Fabricio makes a clumsy challenge on Soares but the Portugal full-bak manages to get his shot away which is saved by Tim Krul. Georginio Wijnaldum is enjoying himself out there in front of the home fans and looks to get forward with some driving runs. Cedric Soares cynically tugs at the Dutchman to earn himself a booking. The resulting free-kick from Wijnaldum doesn't cause too much trouble. "What a chance - that was just about Georginio Wijnaldum's first kick of the ball in the Premier League - he kept his shot on target but should have done better. What a chance for Steve McClaren to begin his tenure at Newcastle with a goal." Great chance for Newcastle's £14.5m man Georginio Wijnaldum to score his first Premier League goal. Moussa Sissoko makes a great run and squares to Wijnaldum in the box but the Dutchman's shot is blocked by Steven Davis' chest. Jay Rodriguez makes his first contribution but his cross just evades Graziano Pelle. Cedric Soares catches Gabriel Obertan and Newcastle have a free-kick on the left near the touchline. Georginio Wijnaldum puts a good ball which travel through a lot of bodies before Maarten Stekelenburg makes a simple save. And we are under way..
Jack McLeod: The strongest Newcastle squad I've seen in years. Cabella not even in it. Excited! KoloKK: The Netherlands makes fine goalkeepers. Two of the current best are between the sticks on Tyneside today. Here is a stat that makes grim reading for Newcastle fans, but can Steve McClaren buck that trend today? Southampton have won their last three league games against Newcastle, scoring 10 and conceding just one. The teams are in the tunnel...we are almost ready for kick-off. There's no Remy Cabella for Newcastle today - there he is high up in the stands at St James' Park. Quote Message: I played under Steve McClaren when he was England manager and I worked under him at QPR last season. What I can say is that those Newcastle players are going to feel loved and they are going to be prepared. As a manager, there may be certain other aspects Steve needs to work on." I played under Steve McClaren when he was England manager and I worked under him at QPR last season. What I can say is that those Newcastle players are going to feel loved and they are going to be prepared. As a manager, there may be certain other aspects Steve needs to work on." Southamton assistant manager Erwin Koeman on brother Ronald: "He's at home but he will be watching the game. We wish he was here but he'll be back soon." Yes! Chancel Mbemba, this is how you turn up for your first day at work. Newcastle's new summer signings Georginio Wijnaldum and Chancel Mbemba both start in Steve McClaren's first Premiership game in nine years while Aleksandar Mitrovic is on the bench. Subs: De Jong, Aarons, Perez, Tiote, Darlow, Taylor, Mitrovic. England striker Jay Rodriguez makes his first Premier League start in 491 days, since he ruptured his anterior cruciate knee ligament in April 2014. Dutch goalkeeper Maarten Stekelenburg and Portugal full-back Cedric also makes their Premier league debuts for the Saints. Southampton: Stekelenburg, Cédric, Fonte (c), Yoshida, Targett, Wanyama, S. Davis, Tadić, Mané, Rodriguez, Pellè. Subs: Long, Martina, Ward-Prowse, Reed, Juanmi, Gazzaniga, Caulker. It's the first Sunday fixture of the Premier League season but one man who may miss the action is Southampton manager Ronald Koeman. The Dutchman is unlikely to be at St James' Park as he recovers from an operation on his Achilles tendon. So Ronald if you are following our coverage from your sick bed get well soon.